Periodontal destruction is initiated by bacteria that stimulate host responses leading to excess production of cytokines. Anticytokine therapy for periodontal diseases especially targets proinflammatory cytokines, that is, TNF-α, IL-1, and IL-6, because these are essential for the initiation of the inflammatory immune reaction and are produced for prolonged periods in periodontitis. This therapy aims to bind the cytokines with the receptors present on target cells such as the fibroblasts. The three basic treatment strategies are: (1) neutralization of cytokines, (2) blockage of cytokine receptors, and (3) activation of anti-inflammatory pathways, such as, immune-suppressive pathways. This new therapy can act as a host response modulator in the control of inflammatory diseases of gums and may provide the basis for new molecular therapeutic approaches to the treatment of periodontitis. Aims and Objectives: The aim of the present study was to investigate systemic levels of inflammatory markers of cardiovascular diseases like C-reactive protein and interleukin-6 in patients with chronic periodontitis, in comparison to periodontally healthy individuals. Materials and Methods: A total of 42 individuals, both males and females above the age of 30 years, were included in the study. 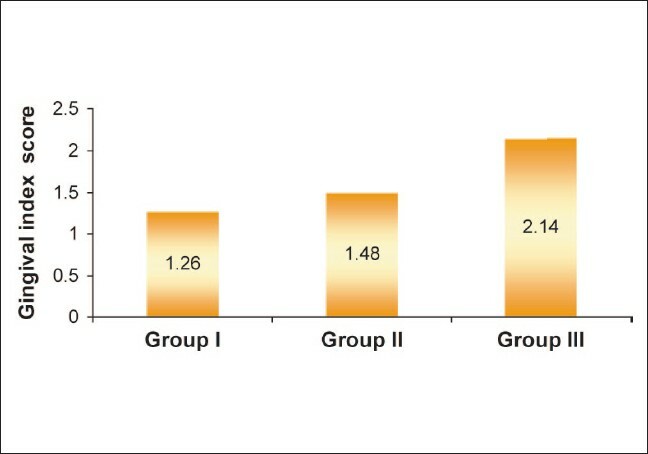 Healthy controls (Group I, n = 14), chronic localized periodontitis (Group II, n = 14), and chronic generalized periodontitis (Group III, n = 14), all without any medical disorder, were recruited. Peripheral blood samples were taken and C-reactive protein (CRP) levels were estimated in the serum samples by using the Particle-Enhanced Turbidimetric Immunoassay (PETIA) technique. Serum samples of Interleukin-6 (IL-6) were assayed by using the Chemiluminescent Immunoassay (IMMULITE) technique. 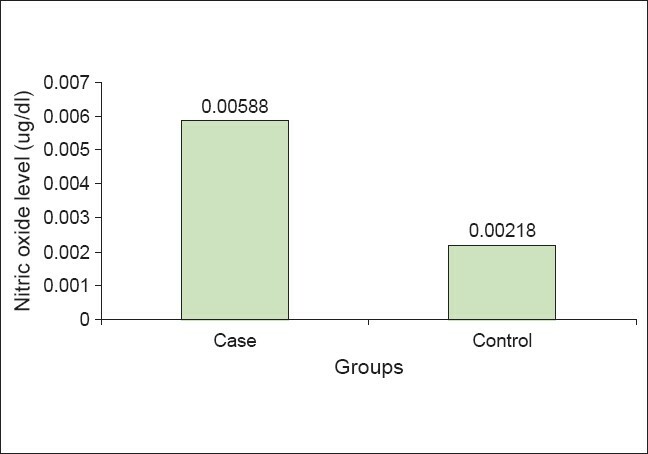 Results: When mean CRP levels were compared between the groups, group III showed statistical significance when compared to group I (P = 0.04). Group III had a higher median IL-6 level (6.35 pg/mL) than Group II (< 5.0 pg/ mL) and group I (< 5.0 pg/mL). Differences in median values of IL-6 were not statistically significant in any group (P = 0.29). 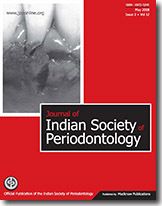 Conclusion: Periodontitis results in higher systemic levels of CRP and IL-6. These elevated inflammatory factors may increase inflammatory activity in atherosclerotic lesions and potentially increasing the risk for cardiovascular events. Nitric oxide (NO) is not only important in host defense and homeostasis but it is also regarded as harmful and has been implicated in the pathogenesis of a wide variety of inflammatory and autoimmune diseases. 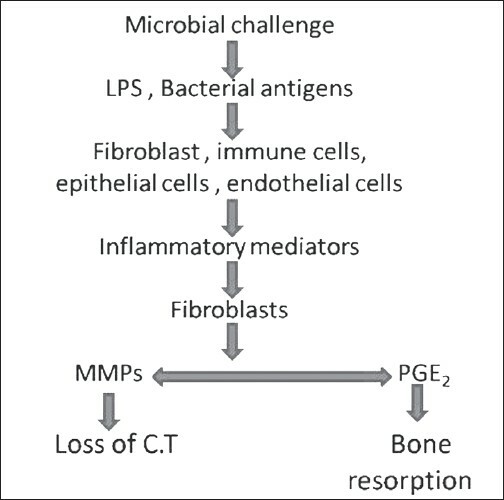 The presence of NO in periodontal disease may reflect the participation of an additional mediator of bone resorption responsible for disease progression. The aim of this study was to assess the level of NO in serum in chronic periodontitis, and correlate these levels with the severity of periodontal disease. Sixty subjects participated in the study and were divided into two groups. NO levels were assayed by measuring the accumulation of stable oxidative metabolite, nitrite with Griess reaction. Results showed subjects with periodontitis had significantly high nitrite in serum than healthy subjects. NO production is increased in periodontal disease, this will enable us to understand its role in disease progression and selective inhibition of NO may be of therapeutic utility in limiting the progression of periodontitis. Introduction: Adjunctive therapy with locally delivered antimicrobials has resulted in improved clinical outcomes. The aim of this study was to evaluate the efficacy and safety of locally administered minocycline microspheres (Arestin TM ) in the treatment of chronic periodontitis. Materials and Methods: A total of 60 sites from 15 patients in the age group of 35-50 years, who had periodontal pockets measuring 5-8mm and had been diagnosed with chronic periodontitis, were selected for the study. The selected groups were randomly assigned to either the control group (group A) or the treatment/test group (group B). Only scaling and root planing were done at the base line visit for the control sites followed by local application of Arestin™ (1mg). Clinical parameters such as plaque index, gingival index, and gingival bleeding index were recorded at baseline, day 30, day 90, and day 180 in the selected sites of both the groups. Probing pocket depth also was recorded at baseline, day 90, and day 180 for both the groups. Results: A statistically significant reduction was observed in both groups. Group B showed better results than Group A and these differences were statistically significant. Conclusion: The results of this study clearly indicate that treatment with scaling and root planing plus minocycline microspheres (Arestin™) is more effective and safer than scaling and root planing alone in reducing the signs of chronic periodontitis. Background and Objectives: The evaluation of gingival margin position (GMP) plays a vital role in periodontal therapy and is critical in esthetic/plastic surgical procedures revolving around restorative dentistry. Comparative evaluations of GMP measurements in various periodontal therapies are scarce. Thus, the objectives of this study are to measure the alteration in the gingival margin position following various therapies, and to compare GMP alterations among different treatment modalities from the baseline to six months after therapy. Materials and Methods: The changes in GMP were studied for MB, B, DB, ML, and L sites for SRP, curettage, and flap surgery, and for MB, B, and DB sites for crown lengthening cases at the end of one, three, and six months after therapy. The results were interpreted from baseline to one, three, and six months posttreatment. Statistical Analysis : The results were subjected to statistical analysis. Paired 't'-test was used for intra-group comparisons and intergroup comparisons were done by one-way ANOVA. Results: The GMP changed from baseline in all the sites at different time periods following various therapies. The net results after six months were an apical shift of GMP in SRP, curettage, and flap surgery, and a coronal shift of GMP in crown lengthening. Conclusion: GMP shows various patterns of alteration after various periodontal therapies. One should wait for the GMP to become stable before attempting any restorative procedure. Aging is one of the major health challenges today. Most of the diseases related to aging, lead to significantly increased morbidity and mortality and higher public expenditure of funds. The interconnection between socio- economic conditions and social vulnerability is reflected in precarious states of health with prominence of high rates of osteoporosis and periodontal disease.Both these diseases have been highlighted in public health because of the impact caused by bone fracture and tooth loss. Thus, the elderly could help live a healthier and more meaningful life with the prevention of these diseases. To evaluate the efficacy of platelet-rich plasma concentrate in the management of a cirumferential, infrabony defect associated with an endoperio lesion in a maxillary canine. A 45 year-old male patient with an endoperio lesion in the left maxillary canine was initially treated with endodontic therapy. Following the endodontic treatment, the circumferential, infrabony defect was treated using platelet-rich plasma and an alloplastic bone substitute. 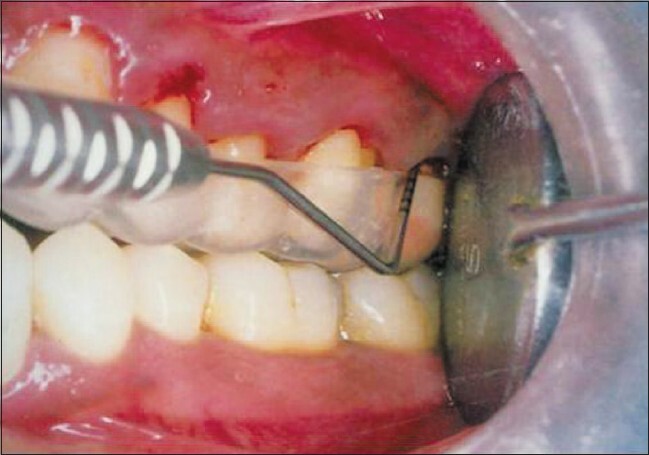 At the end of three months, there was a gain in the clinical attachment level and reduction in probing depth. Radiographic evidence showed that there was significant bony fill. The results were maintained at the time of recall nine months later. The recession of gingiva is increasingly becoming a more prominent condition in the oral health of many patients and should be treated at its earliest detection. 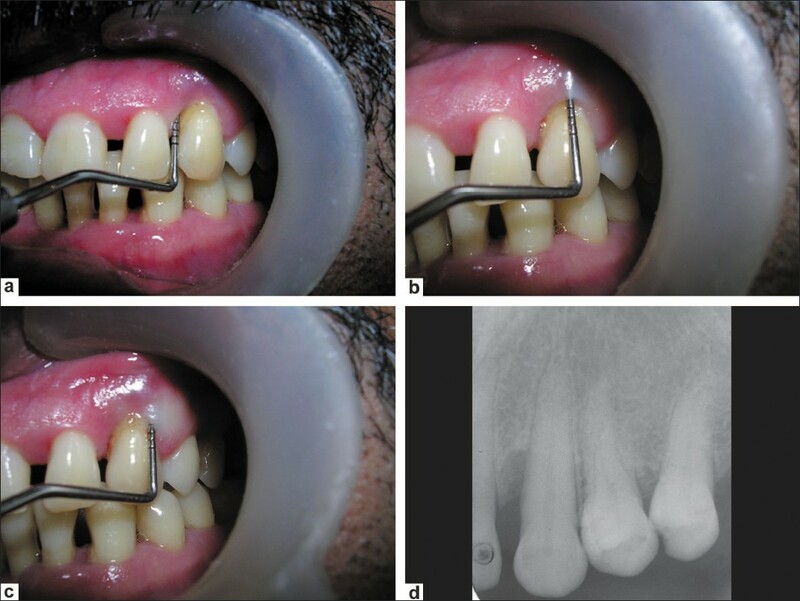 The multi-factorial etiology, decision modality, and current trends followed in treatment of gingival recession are discussed in this presentation. 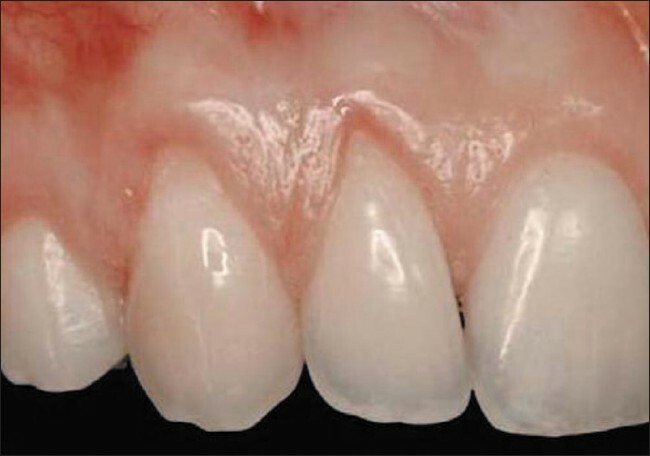 The correction of class I and II gingival recessions are presented as a means of minimizing surgical trauma and achieving predictable aesthetic results. In this case report, I present an alternative technique in treating gingival recession- the tunnel connective tissue graft. Tuberculosis is a chronic specific granulomatous disease and a major cause of death in developing countries. The clinical presentation of tuberculosis lesions of oral cavity varies widely, including ulceration, diffuse inflammatory lesions, granulomas and fissures. Oral lesions usually appear as secondary to primary tuberculosis infection elsewhere, although primary infection of the oral mucosa by Mycobacterium tuberculosis has been described. We report a case of tuberculosis of gingiva, manifesting as gingival enlargement. Diagnosis was based on histopathological examination, complete blood count, X-ray chest and immunological investigations with detection of antibodies against Mycobacterium tuberculosis. Anti-tuberculous therapy was carried out for over six months. 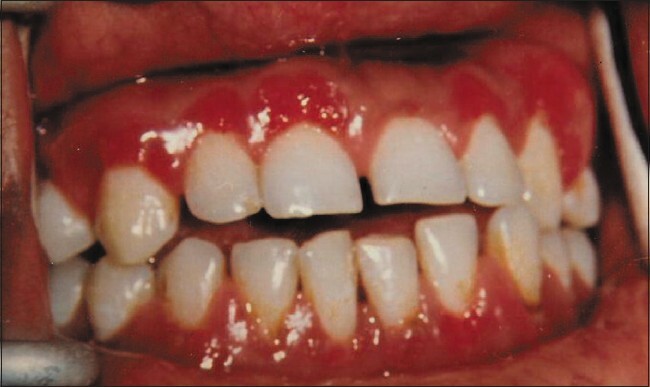 This case report emphasizes the need for dentists to include tuberculosis in the differential diagnosis of various types of gingival enlargements. An atypical and rare case report is presented here of a 16 years old female patient who presented with severe, unilateral, gingival enlargement along with aggressive periodontitis around first molars that was confined to the left side of her mouth. A careful recording of the case history and results of clinical examination, laboratory blood analysis, radiological findings, and microbiological and histopathological investigations were noted and a critical review of similar conditions was taken into account to arrive at the said diagnosis.